Artist residencies aboard Eimskip container ships connect culture and business across the North Atlantic ocean. With this, the shipping company has somewhat revived an old tradition in its 104 year long history; shown how businesses can contribute to culture from within, and how their working and operational environment can become the source of multimedia and visual art. Read on about the project and to find accounts from each experience below. Maine artist, Anneli Skaar, recently delivered an oil painting in hues of blue to Icelandic shipping company Eimskip, reviving a tradition of accepting art as payment for passage on an Eimskip vessel. “It’s a memory that I had as we were leaving Newfoundland to start our crossing across the North Atlantic, I could sense this beautiful light and see ourselves in another ship that was leaving the harbor,” said Skaar. Skaar is one of six Maine artists that have taken part in a developing residency program that allows them to travel on a cargo ship from Portland, Maine, to Iceland. The idea came out of a meeting between Larus Isfeld, the Managing Director at Eimskip USA, and Patrick Arnold, President of Soli DG, which operates the marine terminal in Portland, where Eimskip has its North American headquarters. “It grew out of the idea how can we get people to exchange cultures,” Isfeld said. Eimskip moved its US operations to Maine in 2013. It currently makes 52 trips a year out of Portland, carrying everything from cars to televisions and seafood between the US and Europe. Arnold calls freight the “lifeblood of the economy", yet most of the work happens outside of public view. Inviting artists to travel on the ships offered a way to open up that world, and in the process, make people aware of the growing connection between Maine and the North Atlantic. Giving artists passage on an Eimskip vessel is a revival of an old practice that was commonplace for the company in its early days of operation, when their ships carried both cargo and passengers. Artists would offer the company an original work in exchange for passage. Over the years, Eimskip has amassed an impressive collection of art that it displays in its company headquarters in Reykjavik. Photographer Justin Levesque was the first Maine artist to take part in this updated version of art for passage. Levesque, from Portland, has been fascinated by Iceland for years. “I’ve been aware and obsessed with Iceland as long as I can remember, probably the 8th grade,” said Levesque. He traveled to the country in 2014, and had an “amazing experience". When he returned home he saw the same blue shipping containers on the Portland waterfront he had seen in Iceland. “I found all of this information about Iceland moving into my backyard. I became aware of the operation and the scale and what their entry into the Maine market could mean,” said Levesque. With the support of Eimskip, Levesque boarded the vessel Selfoss in October 2015 and began a nine day journey at sea to Iceland. He was nervous but excited to embark on a portrait series of the Selfoss crew. According to Levesque, "everyone was really open and I think Icelanders in general have a built in concept of culture and art projects, it didn’t seem funny to them". 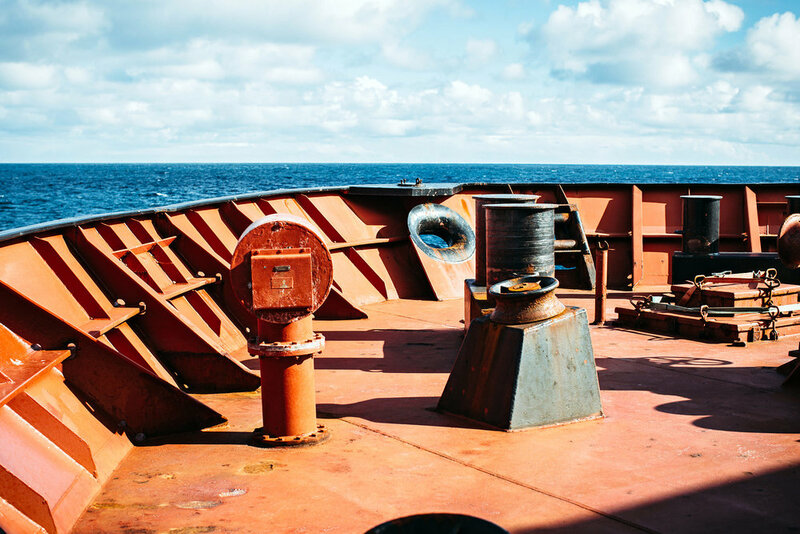 On his return, Levesque curated a show of his photographs from the ship called ICELANDx207, which he displayed in an Eimskip shipping container at several locations in Maine. More than two thousand people have walked through the container. Anneli Skaar and multi-media artist Jonathan Laurence, from Rockland, Maine, were the next artists to take part in the residency, also traveling on Selfoss, in February of 2016. She spent much of her time painting and writing, enjoying the quiet and isolation of life at sea. Laurence took advantage of full access to the ship, taking photographs from the top of a crane and shadowing workers as they moved in between the shipping containers. Skaar says the crew tested them on night one, serving the two artists lamb testicles for dinner. They were game, and the crew opened up to them, eventually forming friendships. When the pair returned to Europe a year later they reconnected with people from the ship. Portland journalist Tom Bell and his then 20 year old daughter Ihila Lesnikova, a student at the School of Cinematic Arts at the University of Southern California, boarded Bruarfoss in June of 2016 for a two week trip that included a four day stop in Reykjavik. As a business reporter, Bell had written extensively about Eimskip in Maine and wanted to experience the crossing for himself. It was also an opportunity to spend time with his daughter as they both experimented with new ways to deliver media content. While on board, they created podcasts they uploaded each night, the only time they had internet access. Bell also shot and edited videos highlighting different aspects of life on the ship. He enjoyed the quiet and routine of the crossing, but his daughter struggled. “I was sea sick and had cabin fever, and I realized that the mariner lifestyle was not for me. The mariners’ jobs are intense, dangerous, and they work around-the-clock in shifts. I have so much respect for what they do, but I prefer to stay on land,” said Lesnikova. Their most popular podcast turned out to be the one where Ihila was breaking down, physically ill and feeling isolated. Their work gave people a personal look of life at sea. The residency began somewhat informally, but as word has spread and interest has grown, it is taking on more structure, starting with a name. They chose Skáld and the Sea. In the Viking age, “Skálds” composed poetry and songs as a way to record history for the people who hired them. Today’s storytellers have more means of expression but essentially do the same thing as the Viking Skálds, they explore the world through creative endeavors and share their interpretation of a moment in time. When singer/songwriter Connor Garvey boarded Reykjafoss this past June, he brought a guitar and sense of adventure. He had hoped to write three songs, he ended up with nine. “When you are hundreds of miles and many days away from land and traveling over miles of deep waters it's easy to feel vulnerable and alone. Fortunately these are wonderful places to be for a songwriter! I spent hours lost in wondering thought and horizon watching (and one day in complete seasickness) which lent itself to some heartfelt songs. Some songs came from my experience there, some were reflective to home, and many were influenced by the men, conversations, and time alone on the ship,” said Garvey. All of the artists will contribute some of the content they created during the residency to Eimskip, which plans to build a gallery as part of their new North American headquarters in Portland. That project is currently under development. Eimskip also wants to bring artists the other way, from Europe to Maine. They are talking with an artist from Norway about being the first to take the journey in the opposite direction.